This quilt block is one of the classics and has been around for a very long time! Follow the instructions below to create your own version. 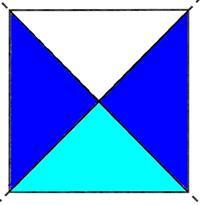 One 5 1/4" square, cut twice diagonally into quarter square triangles. - One 5 1/4" square, cut into quarter square triangles. Lay out your fabric pieces beside your sewing machine, to see which triangles to sew together. 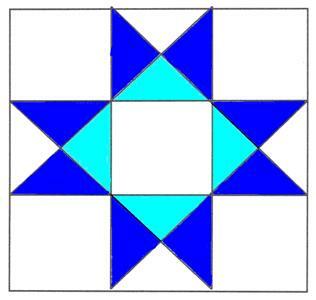 Sew triangles together into squares as shown below, then sew squares together in the order of the first, second, and third row. When sewing rows together, you always want to try to press your seams in opposing directions. the bottom row to the outside again. Now press your long seams to whichever side they seem to want to go, and you have your beautiful quilt block finished! Finished with "Ohio Star Quilt Block" Return to "Learn to Quilt"
Or go to "Dutchmans Puzzle Quilt Block"